Child: "You always buy her whatever she wants! You never do that for me! You love her more!" When your child challenges your fairness, remember to to say what the child is feeling without defending your actions. This is harder than it sounds, since we are programmed to defend. But, if a child fusses about unfair treatment and we jump in with all kinds of defenses like, "I bought her those shoes because she needed them," or "The ones you wanted cost too much for our budget," we are in effect validating the problem. SWYS: "Sounds like you are sure that because I bought her the shoes she wanted I love her more." The core of sibling rivalry is favoritism. Kid's are sure this is real. And here's a funny thing--when we are afraid to voice our children's fears, we validate those same fears. However, when you can address children's fears head on, they feel reassured. It might sound backwards, but it's true; if it's safe to talk about, it must not be that bad. Kids get very nervous when we can't talk about something. A child's unconscious answer to his own question, "Why can't Mom or Dad say that?" or "Why do they need reasons or proof?" is "It must be true." SWYS: "And you noticed I do that, too. I'll bet you notice a lot of things. Sounds like to you it seems I'm always doing more for her than you, and you feel really sad about that. Sometimes I've even heard you say that you wish she had never been born. Wow, it's got to be really hard for you to feel like your Mom [or Dad] loves your sister more!" STRENGTH: "You've been so brave, feeling all alone and trying to find ways to feel special. And even though you feel jealous, you still find ways to be nice to your little sister sometimes. Just yesterday, I saw you..."
And then you carry this out into daily life, and watch for other strengths the child shows as he/she interacts with little sister while overcoming his/her fear, remembering that the favoritism issue is real for the child. Also, know that a child who compares what you buy, or the minutes you spend, or the size of the slice of pizza to prove you love a sibling more, cannot stop comparing. In the case of my older daughter, instead of telling her to stop, we helped her see comparing as one of her strengths and assigned her to be the one to cut cakes, break cookies, pour milk, etc. Because she was so good at getting things exactly the same, she became our expert comparer and is still the best at dividing things up. The difference is that she is now proud of it instead of embarrassed by it. One other point here: Check to see that you don't believe you love one child more than the other. If you believe you do, you will find yourself constantly trying to make up for the disparity and your children will pick up on that for sure. They have radars for guilt. Before you give in to your guilt, consider this. Even if one child is easier for you to enjoy than another (which is true for most parents), and whether or not you realize you love both (or all), and whether or not your parental love registers as an emotion, I still believe that you do love your children. Love is why you even care whether or not they feel loved; and love is what drives you to read articles like this in search of ways to reconnect. 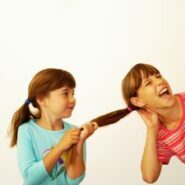 GREAT post on sibling rivalry. So great, in fact, and such a big problem for those for whom it IS a problem, that I think you should teach a sibling rivalry class. Yes, it would include essentially the same things you include in your regular class, but it would be framed for dealing with sibling rivalry, and it would help parents in two ways: 1. they would be relieved to have a concrete way to address the issue which is troubling their family, and 2. They would benefit from being able to talk with and hear from other parents concerned with the same issues. Of course this would also benefit them in practicing the technique they can use with any parenting issue, but there is a certain comfort in feeling that you are taking a class specifically addressing sibling rivalry. Julia, Thanks for your thoughtful comment and great suggestion. Sounds like a potential SWYS Basics Part III. Very easy to do. Maybe even a class, teleseminar or webinar on sibling rivalry. I love your advice particularly because it’s simple to put into effect. I’d love to see an article on sibling violence. Siblings who pinch, kick, hit, body slam, and so on. It’s a special category that deserves a special answer! Alegra, thank you for letting me know you find my approach simple and practical. Sibling violence is indeed an important topic. Thank you for your thoughtful suggestion. 1. Relationship–Improving the parents’ relationship with each child and the children’s relationship with each other. 2. Boundaries/Self-control–Increasing the children’s and parents’ awareness of their personal boundaries and self-control. 3. Mediation–Helping children master communication and problem-solving skills. I’ve written posts on all of those parts individually. Until I can put them together in a meaningful way, they can be found by searching on “sibling” or “boundary” and following the relevant links within the posts. (Search function can be found in the sidebar, or below on mobile). However, if the level of violence appears to threaten either child’s safety, please seek the help of a play therapist or other mental health professional immediately. Don’t wait! A situation like that is not likely to improve on its own.